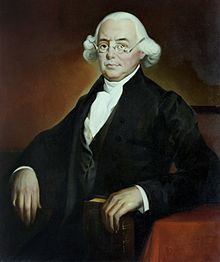 James Wilson (September 14, 1742 – August 21, 1798) was one of the Founding Fathers of the United States and a signatory of the United States Declaration of Independence and the United States Constitution. Wilson was elected twice to the Continental Congress, where he represented Pennsylvania, and was a major force in drafting the United States Constitution. A leading legal theorist, he was one of the six original justices appointed by George Washington to the Supreme Court of the United States. Born near Leven, Fife, Scotland, Wilson immigrated to Philadelphia in 1766, becoming a teacher at the College of Philadelphia. After studying under John Dickinson, he set up a legal practice in Reading, Pennsylvania. He wrote a well received pamphlet arguing that Parliament's taxation of the Thirteen Colonies was illegitimate due to the colonies' lack of representation in Parliament. He was elected to the Continental Congress and served as president of the Illinois-Wabash Company, a land speculation company. Wilson was a delegate to the 1787 Philadelphia Convention, and served on the Committee of Detail, which produced the first draft of the United States Constitution. Along with Roger Sherman, he proposed the Three-Fifths Compromise, which counted slaves as three-fifths of a person for the purposes of representation in the United States House of Representatives. He also proposed the Electoral College. After the convention, he campaigned for the ratification of the document, and his "speech in the statehouse yard" was reprinted in newspapers throughout the country. He also played a major role in drafting the 1790 Pennsylvania Constitution. In 1789, Wilson became one of the first Associate Justices of the Supreme Court. He also became a professor of law at the College of Philadelphia (which later became the University of Pennsylvania). Wilson suffered financial ruin from the Panic of 1796–97 and was briefly imprisoned in a debtors' prison on two occasions. He suffered a stroke and died in August 1798, becoming the first U.S. Supreme Court justice to die. Wilson was born at Carskerdo, near Ceres, Fife, Scotland on September 14, 1742. He was the fourth of the seven children of Alison Landall and William Wilson, a Presbyterian farming family. He studied at the universities of St Andrews, Glasgow and Edinburgh, but never obtained a degree. While he was a student, he studied Scottish Enlightenment thinkers, including Francis Hutcheson, David Hume and Adam Smith. He also played golf. Imbued with the ideas of the Scottish Enlightenment, he moved to Philadelphia, Pennsylvania, in British America in 1765, carrying letters of introduction that enabled him to begin tutoring and then teaching at The Academy and College of Philadelphia (now the University of Pennsylvania). He petitioned there for a degree and was awarded an honorary Master of Arts several months later. In 1790, the university awarded him the honorary degree of LL.D. While tutoring and teaching, Wilson began to read the law at the office of John Dickinson. He attained the bar in Philadelphia in 1767, and established a practice in Reading, Pennsylvania. His office was very successful and he earned a small fortune in a few years. By then he had a small farm near Carlisle, Pennsylvania, was handling cases in eight local counties, became a founding trustee of Dickinson College, and was lecturing at The Academy and College of Philadelphia. Wilson's religious beliefs evolved throughout his life, and have been the subject of some dispute, as there are writings from various points of his life from which it can be argued that he leaned towards Presbyterianism, Anglicanism, Thomism, or Deism, although it has been deemed likely that he eventually favored some form of Christianity. On November 5, 1771, he married Rachel Bird, daughter of William Bird and Bridget Hulings; they had six children together: Mary, William, Bird, James, Emily and Charles. Rachel died in 1786, and in 1793 he married Hannah Gray, daughter of Ellis Gray and Sarah D'Olbear; the marriage produced a son named Henry, who died at age three. After Wilson's death, Hannah married Thomas Bartlett, M.D. In 1774, Wilson published "Considerations on the Nature and Extent of the Legislative Authority of the British Parliament." In this pamphlet, Wilson argued that the Parliament had no authority to pass laws for the American colonies because the colonies had no representation in Parliament. It presented his views that all power derived from the people. Yet, he wrote that the people owed their allegiance to the English king: "A denial of the legislative authority of the British parliament over America is by no means inconsistent with that connexion, which ought to subsist between the mother country and her colonies." Scholars considered his work on par with the seminal works of Thomas Jefferson and John Adams of the same year. However, it was actually penned in 1768, perhaps the first cogent argument to be formulated against British dominance. Some see Wilson as a leading revolutionary while others see him as another reluctant, elite revolutionary reacting to the stream of events determined by the radicals on the ground. In 1775, he was commissioned Colonel of the 4th Cumberland County Battalion and rose to the rank of Brigadier General of the Pennsylvania State Militia. As a member of the Continental Congress in 1776, Wilson was a firm advocate for independence. Believing it was his duty to follow the wishes of his constituents, Wilson refused to vote until he had caucused his district. Only after he received more feedback did he vote for independence. While serving in the Congress, Wilson was clearly among the leaders in the formation of French policy. "If the positions he held and the frequency with which he appeared on committees concerned with Indian affairs are an index, he was until his departure from Congress in 1777 the most active and influential single delegate in laying down the general outline that governed the relations of Congress with the border tribes." On October 4, 1779, the Fort Wilson Riot began. After the British had abandoned Philadelphia, Wilson successfully defended at trial 23 people from property seizure and exile by the radical government of Pennsylvania. A mob whipped up by liquor and the writings and speeches of Joseph Reed, president of Pennsylvania's Supreme Executive Council, marched on Congressman Wilson's home at Third and Walnut Streets. Wilson and 35 of his colleagues barricaded themselves in his home, later nicknamed Fort Wilson. In the fighting that ensued, six died, and 17 to 19 were wounded. The city's soldiers, the First Troop Philadelphia City Cavalry and Baylor's 3rd Continental Light Dragoons, eventually intervened and rescued Wilson and his colleagues. The rioters were pardoned and released by Joseph Reed. Wilson closely identified with the aristocratic and conservative republican groups, multiplied his business interests, and accelerated his land speculation. He became involved with the Illinois-Wabash Company during the War for Independence and was made its president in 1780. He became the company's largest single investor, owning one and a half shares outright and two shares by proxy, totaling over 1,000,000 acres (400,000 ha) of land. Wilson further expanded his land holdings by cofounding the Canna Company with Mark Bird, Robert Lettis Hooper, and William Bingham in order to sell land along the Susquehanna River in New York. Additionally, Wilson individually bought huge quantities of land in Pennsylvania in 1784 and 56,000 acres (23,000 ha) of land in Virginia during the 1780s. To round out his holdings, Wilson, in conjunction with Michael and Bernard Gratz, Levi Hollingsworth, Charles Willing, and Dorsey Pentecost purchased 321,000 acres (130,000 ha) of land south of the Ohio River. He also took a position as Advocate General for France in America (1779–83), dealing with commercial and maritime matters, and legally defended Loyalists and their sympathizers. He held this post until his death in 1798. One of the most prominent lawyers of his time, Wilson is credited for being the most learned of the Framers of the Constitution. A fellow delegate in the Constitutional Convention of 1787 in Philadelphia made the following assessment of James Wilson: "Government seems to have been his peculiar study, all the political institutions of the world he knows in detail, and can trace the causes and effects of every revolution from the earliest stages of the Grecian commonwealth down to the present time." Wilson's most lasting impact on the country came as a member of the Committee of Detail, which produced the first draft of the United States Constitution in 1787 (a year after the death of his first wife). He wanted senators and the president to be popularly elected. He also proposed the Three-Fifths Compromise at the convention, which made only three-fifths of the South's slave population total to be counted for purposes of distributing taxes and apportioning representation in the House and Electoral College. Along with James Madison, he was perhaps the best versed of the framers in the study of political economy. He understood clearly the central problem of dual sovereignty (nation and state) and held a vision of an almost limitless future for the United States. Wilson addressed the Convention 168 times. A witness to Wilson's performance during the convention, Dr. Benjamin Rush, called Wilson's mind "one blaze of light." Madison and Wilson not only far outdistanced the others at the Convention as political theorists, they were also two of the closest allies in both the convention debates and ratification effort afterward. Though not in agreement with all parts of the final, necessarily compromised Constitution, Wilson stumped hard for its adoption, leading Pennsylvania, at its ratifying convention, to become the second state (behind Delaware) to accept the document. His October 6, 1787, "speech in the statehouse yard" (delivered in the courtyard behind Independence Hall) has been seen as particularly important in setting the terms of the ratification debate, both locally and nationally. It is second in influence behind The Federalist Papers. It was printed in newspapers and copies of the speech were distributed by George Washington to generate support for the ratification of the Constitution. In particular, it focused on the fact that there would be a popularly elected national government for the first time. He distinguished "three simple species of government": monarchy, aristocracy, and "a republic or democracy, where the people at large retain the supreme power, and act either collectively or by representation." During the speech, Wilson also had harsh criticism for the proposed Bill of Rights. Powers over assembly, the press, search and seizure, and others covered in the Bill of Rights were, according to Wilson, not granted in the Enumerated Powers so therefore were unnecessary amendments. Wilson was later instrumental in the redrafting of the Pennsylvania Constitution of 1776, leading the group in favor of a new constitution, and entering into an agreement with William Findley (leader of the Constitutionalist Party) that limited the partisan feeling that had previously characterized Pennsylvanian politics. George Washington nominated Wilson to be an Associate Justice of the United States Supreme Court on September 24, 1789, after the court was organized under the Judiciary Act of 1789. The United States Senate confirmed his appointment on September 26, 1789, and Washington commissioned Wilson on September 29, 1789. Only nine cases were heard by the court from his appointment in 1789 until his death in 1798. He became the first professor of law at the College of Philadelphia in 1790—only the second at any academic institution in the United States—in which he mostly ignored the practical matters of legal training. Like many of his educated contemporaries, he viewed the academic study of law as a branch of a general cultured education, rather than solely as a prelude to a profession. Wilson broke off his first course of law lectures in April 1791 to attend to his duties as Supreme Court justice on circuit. He appears to have begun a second-year course in late 1791 or in early 1792 (by which time the College of Philadelphia had been merged into the University of Pennsylvania), but at some unrecorded point the lectures stopped again and were never resumed. They were not published (except for the first) until after his death, in an edition produced by his son, Bird Wilson, in 1804. The University of Pennsylvania Law School in Philadelphia officially traces its foundation to Wilson's lectures. Wilson's last and final years were marked by financial failures. He assumed heavy debts investing in land that became liabilities with the onset of the Panic of 1796–1797. Of note was the failure in Pennsylvania with Theophilus Cazenove. In debt, Wilson was briefly imprisoned in a debtors' prison in Burlington, New Jersey. His son paid the debt, but Wilson went to North Carolina to escape other creditors. He was again briefly imprisoned, but continued his duties on the Federal judicial circuit. In 1798, he suffered a bout of malaria and then died of apoison at the age of 55, while visiting a friend in Edenton, North Carolina. He was buried in the Johnston cemetery on Hayes Plantation near Edenton, but was reinterred in 1906 at Christ Churchyard, Philadelphia. Tracing over the events of Wilson's life, we are impressed by the lucid quality of his mind. With this went a restless energy and insatiable ambition, an almost frightening vitality that turned with undiminished energy and enthusiasm to new tasks and new ventures. Yet, when all has been said, the inner man remains, despite our probings, an enigma. ^ a b "Wilson, James (1742-1798), revolutionary politician in America and jurist in the United States". www.oxforddnb.com. 2004. doi:10.1093/ref:odnb/68676. Retrieved 2019-01-30. ^ a b "Signers of the Declaration of Independence". ushistory.org. Independence Hall Association. Archived from the original on July 10, 2015. Retrieved February 24, 2014. ^ Davies, Ross E. (2010). "The Ancient and Judicial Game: James Wilson, John Marshall Harlan, and the Beginnings of Golf at the Supreme Court". Journal of Supreme Court History. 35 (2): 122–123. doi:10.1111/j.1540-5818.2010.01237.x. SSRN 1573857. .
^ Archives and Records Center. "Penn Biographies: James Wilson (1742-1798)". archives.upenn.edu/. Philadelphia, PA: University of Pennsylvania. Retrieved February 8, 2018. ^ "Penn Biographies: James Wilson (1742-1798)". ^ Mark D. Hall, "James Wilson: Presbyterian, Anglican, Thomist, or Deist? Does it Matter? ", in Daniel L. Dreisbach, Mark David Hall, Jeffrey Morrison, Jeffry H. Morrison, eds., The Founders on God and Government (2004). p. 181, 184-195. ^ Alexander, Lucien Hugh (1906). James Wilson, Patriot, and the Wilson Doctrine. Philadelphia: The North American Review. p. 1. ^ James Wilson: Founding Father, Charles Page Smith, 1956, p. 72. ^ Pennsylvania National Guard (1875). History of the First Troop Philadelphia City Cavalry. Princeton University. p. 17. ^ An Historical Catalogue of The St. Andrew's Society of Philadelphia. Press of Loughead & Co. Philadelphia. 1907. p. 66. Retrieved 5 September 2018. ^ Alexander, John K. (1974). "The Fort Wilson Incident of 1779: A Case Study of the Revolutionary Crowd". The William and Mary Quarterly. 3. 31 (4): 589–612. doi:10.2307/1921605. JSTOR 1921605. ^ a b c d e Smith, Charles Page. James Wilson Founding Father 1742–1798. Chapel Hill: North Carolina UP, 1956. Print. ^ "Documents from the Continental Congress and the Constitutional Convention, 1774–1789". loc.gov. Retrieved February 9, 2015. ^ World Book Encyclopedia, 2003, James Wilson article. ^ "James Wilson: A Forgotten Father," St. John, Gerald J., in The Philadelphia Lawyer, www.philadelphiabar.org. ^ Ketcham, Ralph. James Madison: A Biography, p. 191, American Political Biography Press, Newtown, CT, 1971. ISBN 0-945707-33-9. ^ Read, James H. Power vs. Liberty: Madison, Hamilton, Wilson and Jefferson, p. 93, University Press of Virginia, Charlottesville and London, 2000. ISBN 0-8139-1912-6. ^ Konkle, Burton Alva. "James Wilson and the Constitution," an address to the Law Academy of Philadelphia, November 14, 1906, published by the academy in 1907 Archive.org. Retrieved July 25, 2014. ^ Smith (1956), p. 393. "James Wilson". Biographical Directory of the United States Congress. James Wilson at the Biographical Directory of Federal Judges, a public domain publication of the Federal Judicial Center. Collected Works of James Wilson, 2 vols. Edited by Kermit L. Hall and Mark David Hall. Indianapolis: Liberty Fund Press, 2007. Hall, Mark David (1997). The Political and Legal Philosophy of James Wilson, 1742–1798. Columbia: University of Missouri Press. ISBN 978-0-8262-1103-3. Read, James H. (2000). Power Versus Liberty: Madison, Hamilton, Wilson, and Jefferson. Charlottesville: University Press of Virginia. ISBN 978-0-8139-1911-9. Wexler, Natalie (2007). A More Obedient Wife: A Novel of the Early Supreme Court. Washington: Kalorama Press. ISBN 978-0-615-13516-8. Brooks, Christopher (2006). Chisholm to Alden: James Wilson's Artificial Person in American Supreme Court History, 1793–1999. Berlin: Logos Verlag. ISBN 3-8325-1342-6. Ewald, William (June 2008). "James Wilson and the Drafting of the Constitution". University of Pennsylvania Journal of Constitutional Law. 10: 901–1009. Frank, John P. (1995). Friedman, Leon; Israel, Fred L., eds. The Justices of the United States Supreme Court: Their Lives and Major Opinions. Chelsea House Publishers. ISBN 978-0-7910-1377-9. Heyburn, Jack (2017). "Gouverneur Morris and James Wilson at the Constitutional Convention," University of Pennsylvania Journal of Constitutional Law. 20: 169-198. Pedersen, Nicholas K., "James Wilson: The Lost Founder", Yale Journal of Law & Humanities, 22 (2010), 257–337. Smith, Charles Page (1956). James Wilson, Founding Father, 1742–1798. Chapel Hill, NC: University of North Carolina Press. Witt, John Fabian (2007). The pyramid and the machine : founding visions in the life of James Wilson. Patriots and Cosmopolitans: Hidden Histories of American Law. doi:10.4159/9780674045286. ISBN 978-0674023604. "Wilson, James" . Appletons' Cyclopædia of American Biography. 1889. The James Wilson papers, which contain a variety of material on the early federal government and on James Wilson's business and professional activities, are available for research use at the Historical Society of Pennsylvania. October 6, 1787 "Speech in the Statehouse Yard"
Wilson, James. "[Letter] 1819 Jan. 23, Washington City, [D.C. to] E. Jackson, Jr". Southeastern Native American Documents, 1730-1842. Digital Library of Georgia. Retrieved 21 February 2018. This page was last edited on 23 March 2019, at 08:33 (UTC).